India yesterday breathed new life into the Celkon Mobile Tri-series with a convincing 102-run Duckworth/Lewis victory over the West Indies at the Queen’s Park Oval. Asked to get a challenging revised total of 274 in 39 overs in response to India’s imposing 311 for 7 off 50, Dwayne Bravo’s side fell way short. And if whoever is selected to replace the newly appointed WI ODI captain tomorrow cannot inspire his men to produce a better result in their decisive game against Sri Lanka at the same venue, despite their two wins in the first two games, the front-running hosts may well find themselves out of Thursday’s final. Bravo, who missed the first game through injury, ruled himself out of tomorrow’s crucial match by notching a second over-rate breach in a single 12-month period. Having been found guilty of a slow over-rate offence in the Champions Trophy match against South Africa last month, Bravo pleaded guilty to the charge brought by the on-field umpires as well as the third and fourth umpires. Photo: West Indies ODI captain Dwayne Bravo is suspended for tomorrow’s match against Sri Lanka. The match referee, Jeff Crowe, fined the skipper 20% of his match fee and his team members half that after the WI were deemed to be one over short of the target at the end of the Indian innings yesterday. Tomorrow is another day but yesterday belonged to stand-in Indian captain Virat Kohli. Photo: India batsman and stand-in captain Virat Kohli. In fine weather, the 24-year-old dashing, middle-order right-hander who has been making a name for himself over the last couple of seasons, capitalized on a solid platform built by openers Shikhar Dhawan and Rohit Sharma. Sent in to bat on a surface that lived up to its pre-match billing of being a good cricket wicket instead of the traditional slow, low, turning Oval track, the Indian openers wasted little time reminding the capacity crowd of why they are the reigning World Cup and ICC Champions Trophy champions. After only 23 overs, they had raced to 123 without loss, with Dhawan on 69 and Sharma on 39. After the departure of Dhawan (69, 77 balls), whose batting earned himself the Golden Bat in the recent Champions Trophy competition, the WI bowlers had their best period. In the next ten overs, they claimed three wickets for 45 runs to give themselves a chance. But Kohli had apparently only been playing dead to ketch Bravo alive. 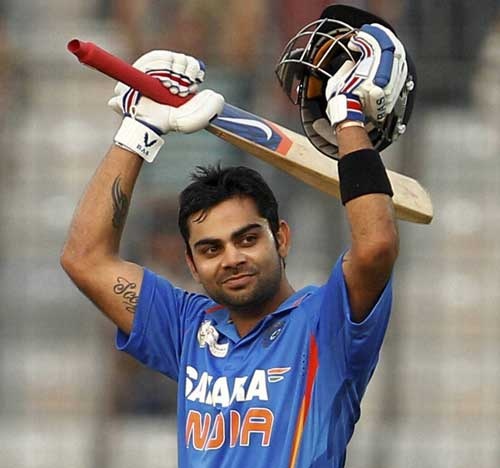 Having used up 55 balls over his first 50, Kohli added another 52 off just 28 to post his 14th ODI century in 103 innings. Only Darren Sammy (8 overs for 28 runs), surprisingly given the new ball, and Marlon Samuels (8 overs for 39 runs) eventually averaged under five as Kohli added six fours and two sixes to the seven boundaries he had scored in his half-century. 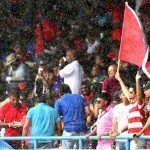 The enthusiastic home side’s supporters went silent as the Indians scored 101 runs in the final 10 overs. Even mystery spinner Sunil Narine, who currently tops the ICC ODI rankings and had the added incentive of playing his first match for the West Indies before his home crowd, could make no impression, bowling five wicketless overs for 35 runs. When the WI batted, the visitors got some help from the weather. A shower that interrupted the innings at 56 for 2 after 10 overs freshened the surface and made an already tough ask even tougher. 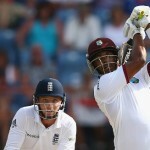 Frequent match-winner Chris Gayle (10, 13 balls) and Darren Bravo (1, 7 balls) were already back in the pavilion but a typically aggressive Johnson Charles (45, 39 balls) was keeping his side in the game. 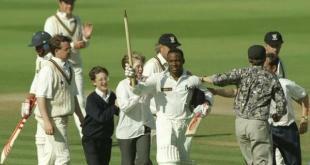 He had already hit four boundaries and two sixes when the rains came at 2:38pm. So well, indeed, that the hosts soon lost six wickets for 57 runs to collapse to 113 for 8 and be finally bundled out for 171. For a while, a defiant ninth-wicket partnership of 58 between Kemar Roach (34, 33 balls) and Narine (21, 33 balls) threatened to take the Windies to the 219 par score needed to deny India a much-needed bonus point. But left-arm spinner Ravindra Jadeja eventually accounted for both in the 34th over to end the Windies’ resistance. Now, India will be hoping the West Indies can defeat Sri Lanka tomorrow to qualify for the final and set up a virtual sudden death shoot-out between them and Angelo Mathews’ defeated Champions Trophy semi-finalists on Tuesday. The Sri Lankans, who put a 161-run thumping on India in Kingston, seemed to have found their best form in their last game and already have a superior net run-rate to the Indians. They may want to bat first to give themselves the chance to improve it – just in case. That is made more likely by the fact that the early-morning surface held no terrors for India’s openers as Bravo probably expected it to and the West Indian decision to send the opposition in seemed to have backfired. But history is on the side of the West Indians, who have won three of the four games contested between the sides at this venue. Photo: Dynamic West Indies batsman Kieron Pollard (right) will stand-in for his Trinidad and Tobago compatriot Dwayne Bravo tomorrow as the regional captain. The home supporters will be hoping that, under stand-in skipper Keiron Pollard, they will be able to make it four out of five. West Indies (probable): Chris Gayle, Johnson Charles, Darren Bravo, Marlon Samuels, Devon Smith, Kieron Pollard (capt), Denesh Ramdin (wkpr), Darren Sammy, Sunil Narine, Kemar Roach, Tino Best. Sri Lanka (probable): Mahela Jayawardene, Upul Tharanga, Kusal Perera, Kumar Sangakkara (wkpr), Dinesh Chandimal, Angelo Mathews (capt), Lahiru Thirimanne, Sachithra Senanayake, Nuwan Kulasekara, Rangana Herath, Lasith Malinga.